Here at Prime Plumbing we often get questions from customers concerning ‘gray water’. When we do, the first thing we like to clarify is what is meant by the term ‘gray water’. 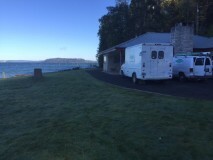 On Vashon Island, if your waste water is connected to the county main line, a gray water reuse system is a benefit in two ways. It will reduce your waste water load into the main sewer and reduce the amount that needs to be treated by the county before being sent into the Puget Sound. Approximately 180,000 gallons of wastewater is treated every day at the Vashon facility. A properly designed and installed graywater reuse system will also reduce the amount of water you draw from your well or utility. Taking gray water waste and piping it out onto your lawn or garden or into a buried pit filled with gravel (or not) is in no way a gray water system. It is a poorly performing and in this state, illegal septic. Two problems arise from such installations. One is that all gray water will become septic within 24 hours, so if it is simply drained outside it quickly becomes dangerous to the health of those who might come into contact with it including pets and children. Secondly, if the gray water does not percolate properly into the soil, it will be swept away by ground water and end up flowing directly into a local stream or into the Puget Sound, certainly not an environmentally friendly result. If you have one of these badly designed systems on your property, the solution is to have the piping re-directed and connected properly to your septic system or to the county main. There are currently plans on allowing systems that can direct clothes washer waste to the exterior of a building for irrigation through ground lines, but these are only plans as of this writing. It is not yet legal. Under no circumstances will gray water ever be allowed to be air born, as in a lawn sprinkler. Gray water reuse systems are only allowed in Washington State if the systems are limited to the interior of a building. Properly designed gray water reuse for the interior of a building begins by directing gray water into a specially designed tank. 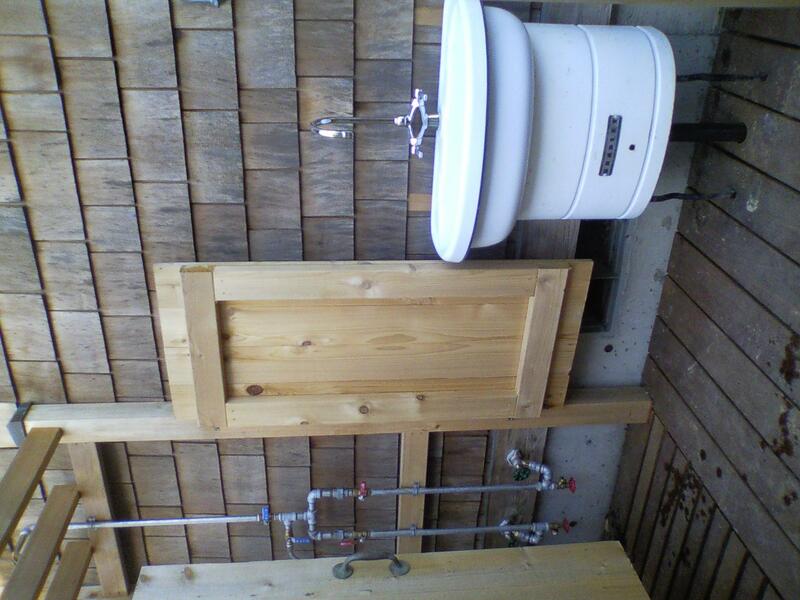 The tank then filters, pumps and distributes the now treated gray water to toilets for flushing. Because gray water turns septic every 24 hours, the tank periodically flushes the unused gray water into the main drain of the house (and out to the septic system or county drain). This flushing sequence is automatic so it doesn’t have to be monitored. The piping that distributes the treated gray water for reuse must be labelled and separate from all other potable water supply piping. Determining whether it is worth the cost to install a reuse system including tank and components, plumbing and electrical work and removing and replacing sheetrock and flooring to route lines is of course up to each home owner or business. What should be calculated is the benefit of reusing gray waste water solely to flush toilets, since this is the only application allowed in the state of Washington. It all depends on usage and the amount of toilets in the building. This calculation can be made during the estimating process. Outdoor shower fixtures that are designed to be installed in cold climates with freezing temperatures are often prohibitively expensive. Not only are they expensive but it is often very difficult to source replacement parts for them if anything fails and since they are mechanical objects subjected to the weather they will always, at some point, fail. We were presented with one of these failed shower fixtures and found after much searching that the manufacturer, a German company, had gone out of business and any replacement parts were non-existent. Our solution was to design a new shower fixture from readily available and easily replaced pipe and fittings. It also came to a fraction of the cost, including labor, of the original. Since then we’ve designed and installed several. 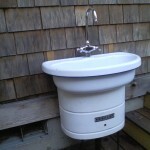 Pictured below is one we installed on Vashon Island. 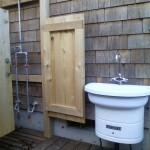 After creating the outdoor shower above our customer purchased the sink shown below from Second Use in Seattle. Our customer had fallen in love with it and wanted to have it installed outside of the house as well near the shower. This meant of course that it too would have to be freeze proof. We were happy to accomodate. We designed the hot and cold supply piping in a similar way to the shower so that it could easily be shut off and drained just below the sink behind the front white panel. 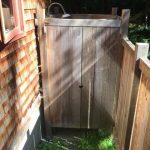 This outdoor shower installation is the one we prefer now (2017). It’s simple, elegant, freeze proof and fully functional. It starts with the installation of a hot and cold frost free hose bib. 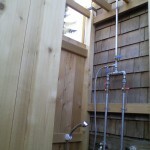 A shower riser with on/off control and a shower head is mounted on the exterior wall. A hose connection is installed between the riser and the valve and Voila! When winter comes simply disconnected the hose as you would any other garden hose. 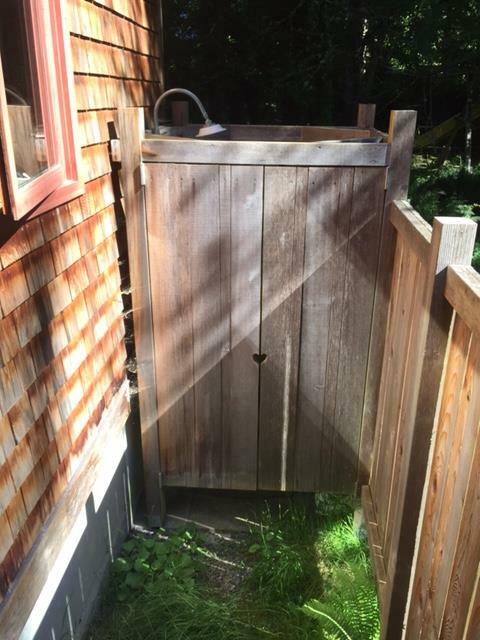 For added convenience, design and function you can have your favorite carpenter construct a cedar stall around it, like the one pictured above. 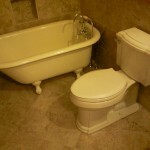 The traditional clawfoot tub is a favorite among soaking tubs. Not only are they beautiful, but they also retain heat much longer than plastic or steel tubs. This is because they are made of cast iron. Cast iron is slow to heat up and slow to cool down. It is a very good regulator. 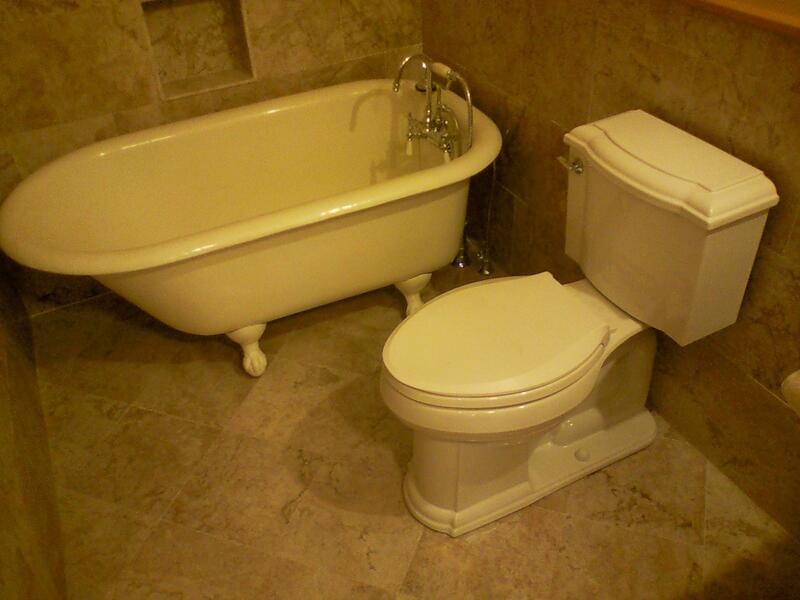 Installing a clawfoot is an interesting process due to the weight of the tub itself (typically 250-300 pounds) and to the total absence of square corners or flat surfaces. We set the tub below into place on a polished marble floor without a scratch. We simply used a combination of furniture dollies, canvas drop cloths and experience. Once in place, clawfoots present a challenge again due to their unique piping design. Yes it’s true that compared to other types of bath tubs a clawfoot takes more time and effort to install however at the end of the day our customers always say it is well worth it. Polybutylene is a semi-rigid plastic like material that will usually have a slight curve to it and will normally be gray in color. All Polybutylene will have a product code of PB2110 stamped onto it and will be repeated every 18” – 24”. The pipe was first introduced in the late 1970’s and was touted as a great innovation for the new construction market. It allowed contractors to install Interior Potable Water Distribution Systems much faster and cheaper than with the more conventional systems such as Copper, Galvanized or CPVC piping. It is estimated that Polybutylene was installed in upwards of 10 million homes, apartments, and commercial structures thru the 1980’s on thru 1995, when it became the subject of a class action settlement, (Shell v. Cox, www.pbpipe.com). It was mainly used in the Sun Belt and Mid-Atlantic States, with some also used in the Pacific Northwest. 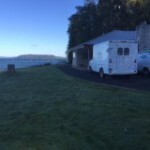 Here on Vashon Island its has been used mainly in manufactured homes. Polybutylene has been declared a defective product because it can prematurely and unexpectedly fail. There are 2 fundamental causes of failure of Polybutylene pipes. First; Chlorine and other oxidants are leached into the pipes which react with the Polybutylene resin causing it to become brittle. As the pipes become brittle, micro-fractures result reducing the structural integrity of the pipe, resulting in leaks. Second, the pipes could have been installed incorrectly. The ease with which Polybutylene could be installed, (didn’t even require experienced pipe fitters or plumbers), paved the way for sloppy installations where the special crimping tools weren’t calibrated regularly causing loose fittings, fitting were installed crooked, pipes were bent and kinked to go around corners, etc. DO YOU HAVE POLYBUTYLENE IN YOUR MANUFACTURED HOME? You may have Polybutylene in your home and not even be aware of it. The most common way to determine whether you have Polybutylene or not is simply to look for it. In most homes you can readily see pipes such as in crawl spaces, ceilings, under kitchen sinks or at the water heater. We can replace your piping with either copper or Uponor Aquapex tubing. Both are time tested materials and conform to UPC plumbing code. If you are concerned about rodents chewing the pipe then copper is the right choice. If not, Aquapex is a quarter the price and much faster for us to work with. Give us a call and we’ll come by for an estimate. The week of November 22nd, 2010 was a rough one here on Vashon. As the cold weather and wind blew in from the north we experienced temperatures reaching as low as 14 degrees Fahrenheit with power outages in some cases lasting from Monday through Thursday, Thanksgiving Day. This wasn’t the first bad storm to hit the island and since it won’t be the last we’ve decided to post this quick primer containing what we hope will be some useful tips on what to do before you have to call your plumber. 1. This island is a mix of differing types of residences. There are mobile homes, Victorian farmhouses, brick and concrete ramblers; the newly constructed; the sustainably designed. It’s in your best interest to know what you have. Do your water lines run through the crawlspace under your house? Through your attic? Have a look sometime. How do you access those spaces? Are they exposed to the cold? What is and what is not insulated? 2. Pipe insulation is usually not enough to prevent freezing pipes. All insulation can do is slow the latent heat in the water from migrating out. It doesn’t stop the process. Electrical heat wrap will actually warm the piping however when the power goes out it’s useless. 3. Where is your main water supply shut off valve? Remember; when the water inside your pipes freezes it can expand and crack the pipe however…the pipes will not noticeably ‘burst’ until it warms up, usually a day or two after the big freeze. When this happens you will need to know where the main water shut off is. If you don’t know where it is ask a neighbor or friend to help you or ask a professional when they come by for a routine service. Once you know where it is label it clearly so that you or anyone staying at your house can quickly identify it if trouble starts. 4. Do you get your water from a well or from a utility? 5. If it’s a well then find out what the valves in your well house do. Label them. Do you have a well house or are the pressure tank and controls located inside your home, garage or crawlspace? 6. 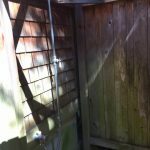 Is there an electrical disconnect or breaker for your well? You can shut off your well (and water) that way. However there will usually be pressurized water in the lines even after you shut the power off because of the pressure tank (that big blue metal tank that you sometimes wonder about). The pressure tank has a diaphragm inside it that will keep the pressure constant for several minutes (what seems like an eternity during a flood). You have to wait but the pressure will subside. This is as it should be. Without this tank your well pump would go on and off every time you operated a faucet. 7. When you get your water from a well and the power goes out then a generator is about the only way to keep your water flowing. Consider installing a natural gas or propane generator rather than a gasoline powered generator. Gasoline can be dangerous when spilled onto a hot generator. You also have to manually refill a gasoline generator. 8. It is difficult for water to freeze when it’s flowing. Open a hot and cold tap and let it flow during a freeze. This alone could save you lots of heartache and expense. 9. Avoid leaving the house when a tap is flowing. Keep an eye on it. If a washcloth slips off the side of the tub and stops the drain, for instance, you might fill that tub quickly enough for it to overflow onto the floor. We’ve seen it happen. 10. Do you get your water from a utility? Good news. You don’t need a generator to keep the water flowing. 11. Have your utility show you where your water meter is and how to shut it off. Is it a shared meter? Better find out before you interrupt your neighbor’s shower. 12. Know where your electrical panel is. Again, if you can’t locate it on your own find someone to help you or ask your electrician. This is often important to know during a leak because of course water and electricity are a very dangerous combination but also because when a pipe bursts and your electric water heater drains out the electrical elements inside will immediately burn out if they are still on. 13. Don’t trust the labeling in your electrical panel unless a qualified electrician does the labeling for you. Labeling often changes as renovations occur, as repairs are made or when a home owner moves in or out. We never trust what a panel says and we always put a meter on the circuit we’re working with. 14. Do you have natural gas or propane? Where is the main shut off for either? 15. Do you have a boiler? Is it or any of its associated piping exposed to the cold? When the power goes out these too can freeze and that’s no fun at all…and it’s an especially expensive repair. 16. Where is the switch that shuts off your boiler? There should be one in the boiler room and you need to know where it is. 17. Is there a backflow preventor on your boiler fill assembly? In other words, when a pipe bursts in your plumbing system and drains the water out, will the water from your boiler system drain out as well? This could mean an expensive repair and if the proper controls are not in place to begin with, a potentially dangerous situation. We’re happy to explain and label your boiler room for you. 18. One last word….Insulation, Insulation Insulation. Okay we know we said earlier that insulation doesn’t necessarily stop your pipes from freezing however, the longer your home retains heat the less likely your pipes will freeze. You will also conserve energy. Insulation is the first step usually in any home energy upgrade. Next are your windows. Are they double paned? Where are you losing the most heat? You can determine all of this and more by getting an energy audit from a qualified contractor. We recommend Greg Kruze of Potential Energy, Inc. (listed under ‘Recommended Contractors’ on this site). After examining several different out building designs on the island where the water heaters or related piping had frozen it’s become clear that a tankless water heater is not a good choice. 1. a direct vent which means a second flue pipe to the unit that draws combustion air from the exterior. The direct vent option is probably the best of the three options. However even with a direct vent there is loss of heat to the outdoors and more importantly, the volume of water in the unit itself is very low and so when it cools down for long enough it easily turns to ice. What I have seen time and time again is that standard tank type water heaters, whether they’re gas or electric don’t freeze even during power outages. Now I may have missed a few electric water heaters out there that have frozen but the ones I’ve seen haven’t. I believe the reasons for this are that the volume of water in the tanks hold heat long enough to withstand any outages and the volume itself keeps the water from freezing. Also with an electric tank you don’t need any openings to the exterior for combustion since there is no combustion so the ambient heat stays in the room. The gas water tanks need combustion openings to the exterior however during a power outage the gas stays on. They don’t require any electrical power so the water stays warm throughout. The additional advantage here is that you have hot water no matter how long a power outage lasts. Here’s a frightening fact: 2.5 million plastic bottles are thrown away every hour in the United States. Yes, 2.5 million an hour. Imagine how that amount contributes to swelling landfills as well as the ever-growing plastic vortex in the Pacific Ocean. Drinking water in one’s kitchen from a cup produces little waste in regard to the environment. But if a person consumed all her daily water from bottles, imagine how quickly that would add up. Bottled water is bad for the planet. No, that chemical doesn’t come from the water; it comes from the plastic. 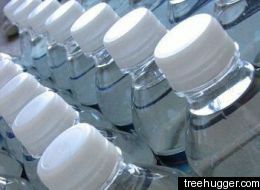 Many plastic bottles contain the chemical bisphenol A, also known as BPA, which can leach into the water in the bottle. Why is this a problem? Studies indicate that BPA exposure is toxic and exposure can cause myriad health problems and can wreak havoc on hormone levels. The FDA is, in typical fashion, moving slowly on the issue, so it is up to consumers to keep themselves safe. * There has been an explosion in bottled water use in the United States, driven in large measure by marketing designed to convince the public of bottled water’s purity and safety, and capitalizing on public concern about tap water quality. People spend from 240 to over 10,000 times more per gallon for bottled water than they typically do for tap water. * Some of this marketing is misleading, implying the water comes from pristine sources when it does not. For example, one brand of “spring water” whose label pictured a lake and mountains, actually came from a well in an industrial facility’s parking lot, near a hazardous waste dump, and periodically was contaminated with industrial chemicals at levels above FDA standards. * According to government and industry estimates, about one fourth of bottled water is bottled tap water (and by some accounts, as much as 40 percent is derived from tap water) — sometimes with additional treatment, sometimes not. The initial goal of this project was to reduce the use of heating oil. The existing Buderus boiler was originally coupled to an indirect storage tank. The storage tank functioned as the water heater for all potable usage. This meant that even during summer when there was no demand for central heating the boiler would still run to heat the potable water in the storage tank resulting in demand for oil throughout the year. We suggested removing the indirect storage tank so that the oil burning boiler would be used for central heating only. We then installed an 80 gallon electric water heater to handle the potable demand. To keep the electrical usage as low as possible we installed the Air Tap. It’s a great fit. Save 766.5 gallons of water per person with the Toto Dual Flush toilet every year. The Toto Aquia toilet’s unique design uses a dual gravity tank that flushes 1.6 gallons for solid waste and 0.9 gallons for liquids. Engineered with a 3 inch internal trap it easily qualifies for the Flushstar list. As of the census 2 of 2000, there are 10,123 people residing on Vashon Island. 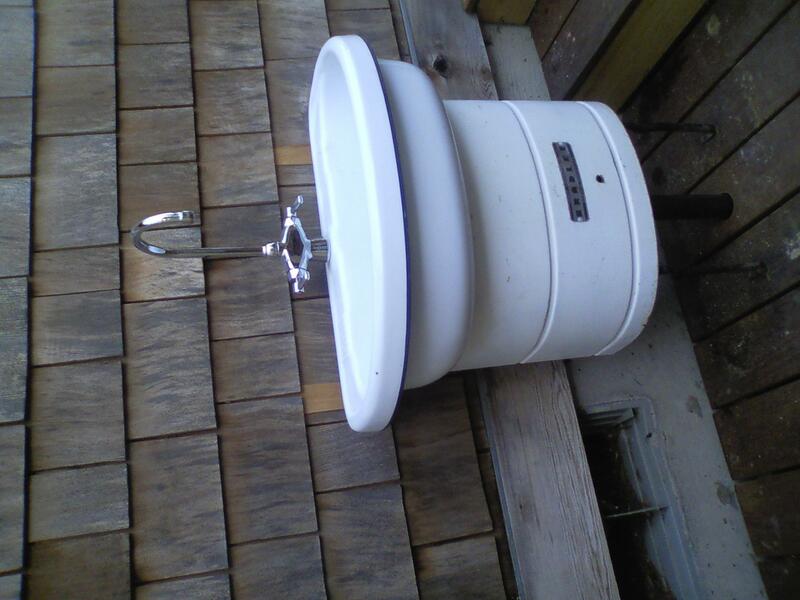 So that’s 766.5 x 10,123 = 7,759,279.5 total gallons saved per year if everyone on Vashon used the dual flush toilet. Now that’s conservation folks. And remember that Vashon Island relies on a single aquifer. We partnered with Artisan Electric, Inc. to install this two panel Caleffi solar hot water system (foreground). A 75 gallon Caleffi storage tank with a single electric element back-up pre-heats the existing 50 gallon electric water heater. The electric back-up element in the solar storage tank means that on days without any solar, the element activates and heats the upper half of the solar tank. This insures that at all times there are 35+ gallons of hot water added to the existing 50 gallons. On solar harvesting days during the summer, the entire 75 gallon solar tank will be heated from the solar panels while the electric element remains off. This means that the existing electric water heater will not require electricity either, as it will be filled with hot water flowing from the solar heated tank. 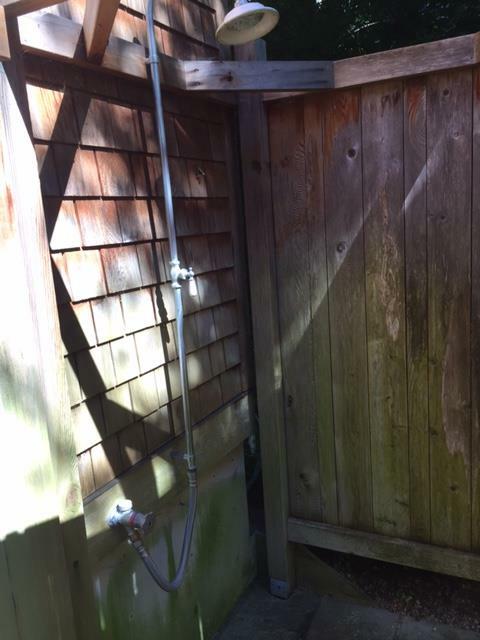 We partnered once again with Jason Williams of Artisan Electric Inc. to place this Thermomax evacuated tube solar collector on Jason and Jennifer’s house on Vashon Island. Jason installed the solar photovoltaic array to the right and that’s our 20-tube collector on the left. This dual PV/thermal system combines well adding solar generated electricity to the savings of solar generated hot water. Evacuated tubes work great for this geographical area and will heat water even on cold, clear days. We installed a 60 gallon solar storage tank in the basement to pre-heat the existing 35 gallon electric water heater. This means that during the winter the electric tank doesn’t have to use very much electricity and during the summer, it doesn’t have to use any at all. Meanwhile, Jason and Jennifer will have the great pleasure of watching their electricity flow backwards into the grid. This was an interesting and challenging installation. 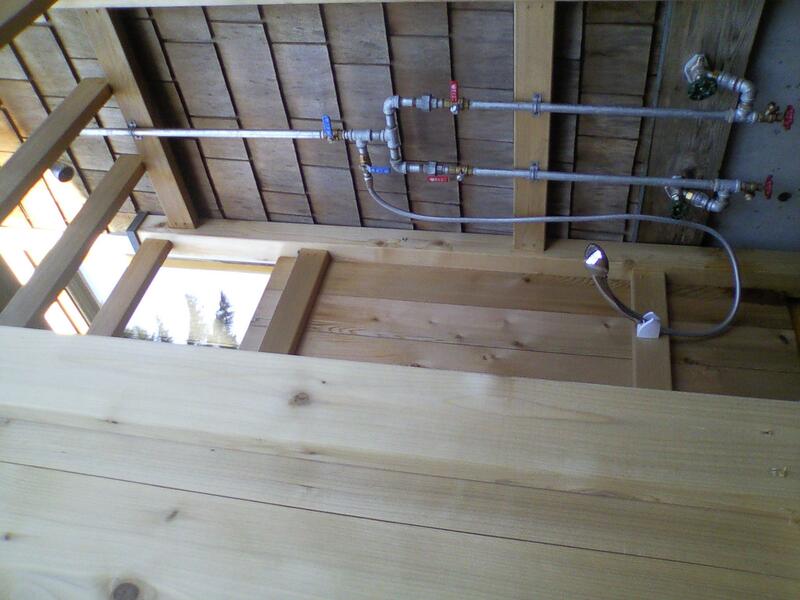 The two panels for this Caleffi system needed to be mounted above the garage , facing south on a roof that pitched west. This meant not only adding aluminum extensions to the standard Caleffi roof mounts in order to achieve pitch, but also adding cross bracing and an additional support on the downside to prevent lateral movement. We fabricated our own roof mount on the latter to accommodate the resulting compound angle. The owner wanted the panels to be hidden below the roof ridge and so a thirty degree pitch was our limit. If the aim is to harvest as much winter sun as possible the collector pitch should be latitude plus five degrees. On Vashon Island this would mean fifty two degrees. However, because there is limited solar gain in the winter months in the northwest, it often makes more sense (especially when it is a solar hot water system only, as opposed to solar heating) to pitch the panels at a lesser degree thereby harvesting as much solar as possible during the summer, when solar gain is highest. The result is more solar collected annually. Sometimes it’s necessary to remove old solar panels. In this case we removed three flat plate panels which had been installed by the previous homeowner so the current owner can install a new roof. After inspecting the old panels we realized that the seals which keep atmospheric moisture out of the panels had deteriorated. The current owner will be gutting the house and remodeling so we are designing a new plumbing system for the new layout which will incorporate a new solar hot water system with new roof panels to augment the new hot water demand. This will include two Takagi natural gas on demand water heaters. The on demand heaters will be augmented by the solar storage tank. When there is not enough available hot water from the solar tank for normal hot water use, a diverter valve will automatically switch to the on demand heaters. These two Aquapure water filters were installed within the main domestic water supply circuit to filter out calcium sediment (limescale) that often appears in well water throughout Vashon Island. 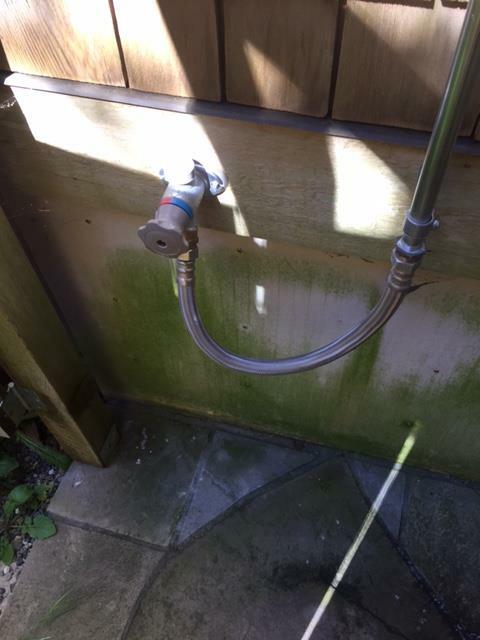 This particular house required a 1 1/4″ water supply therefore the two filters were mounted together on a custom made steel bracket with 1″ piping in parallel. On this same system we included a Sanitron ultra-violet filter to eliminate any microorganisms suspended in the water. The entire system was piped so that each component could be isolated and serviced at any time without affecting it’s normal flow and function. 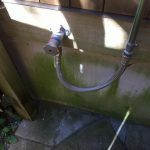 In addition, when there is no domestic water demand the system recirculates the water continuously and when needed it can be backflushed from the furthest plumbing fixture in the house. These three Amitrol tanks were required to provide enough charge for the fire supression system (required by code in most remodels and new construction projects on Vashon). This American Standard toilet is rated in the top ten of best performing toilets on Consumer Reports. It is also included on the FlushStar list. The 1.6 gallon pressure assist flush has the advantage of easily clearing waste without having to flush twice. This model is relatively quiet, only slightly louder than the usual gravity flush. This is typical ‘ground work’ for a two-story new residence on Vashon Island. The main drain piping is brought through the foundation wall and then branch lines are laid out to each ground floor fixture location and to the verticle drains from the floor above.